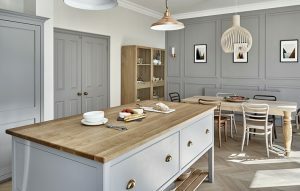 Light and inviting, this bespoke Surbiton kitchen and dining area celebrates the period features of the house, with modern fittings for a trendy and practical space. 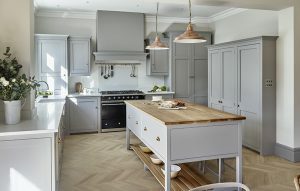 The bespoke contemporary in-frame cabinets give a strong personality to this stylish kitchen, finished in a bright and modern shade of light grey which perfectly complements the Carrara Marble effect composite worksurfaces. 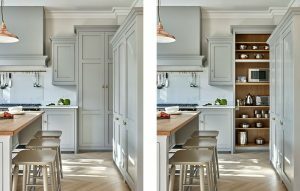 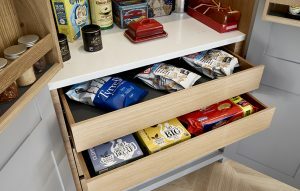 A beautiful oak interior is found inside the cabinets, again adding more neutral contrast to the kitchen. 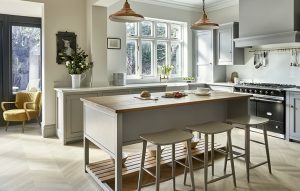 Impressive appliances such as La Canche Cluney range cooker, a tall built in fridge-freezer by Siemens and high powered extractor by Falmec Gruppo Incasso add the finishing touches to this luxury fitted kitchen design. 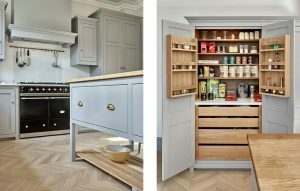 Alongside the in built fridge, a double pantry. 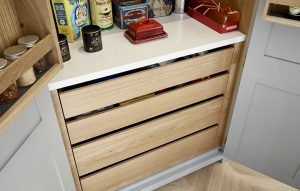 On the cooker wall, a tall storage cupboard with bi-fold doors houses small kitchen appliances such as the kettle, toaster, food blender and microwave. 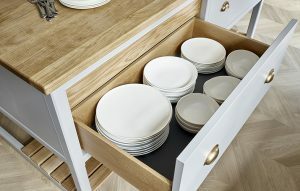 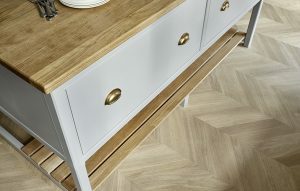 The open island table features deep drawer storage, a solid oak worktop, oak slats and extra seating. 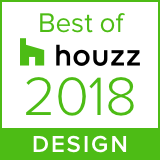 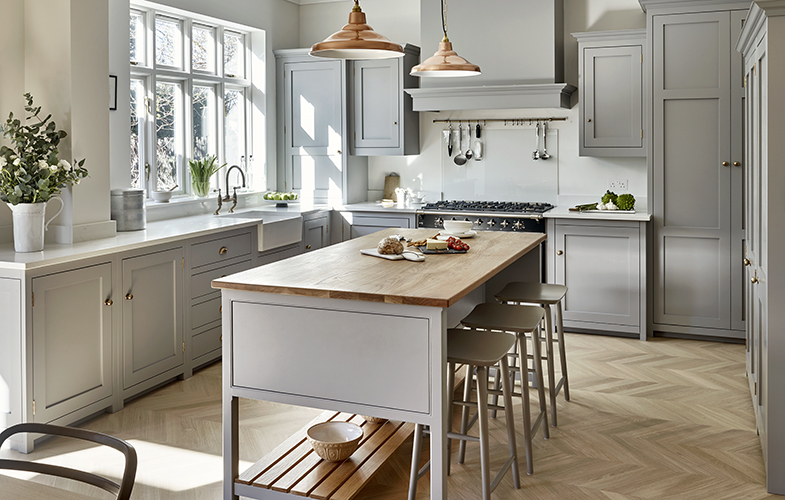 Attention to detail in our kitchens is what we’re known for and this project was no exception – as evidenced in the burnished brass cup handles, knobs and hinges, as well as the Rudge weathered brass taps that further bring the room together. 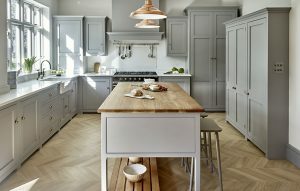 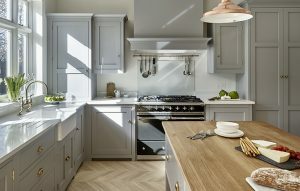 A 24” Normandy butlers sink adds another touch of period charm along with the attractive solid oak chevron parquet floor with a white oiled finish. 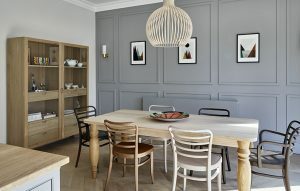 We designed and crafted the bespoke french doors which are finished in the colour ‘Railings’ by Farrow & Ball.